N0HYD - QRP & Portable Adventures! : First JT-65A Contacts! Over the weekend I setup WSJT-X on my old XP computer. I let it do some decoding off and on over the weekend on several bands - and I was decoding well! So last night I went down to the shack about 0350 UTC and fired up the rig on 40 meters. I set WSJT-X to 40 meters and started seeing several signals on the waterfall, and decodes started coming in. Over the next 45 minutes I worked 6 stations - 5 on JT-65 and one on JT-9. It was pretty much back to back QSO's which was fun. I have read a few people complain about the slow speed, and the short contest style exchange. I actually loved both aspects on this mode! I am really not much of a rag chewer, I prefer the hit and run style of contacts. The speed didn't seem abnormally slow to me, about the same length of time a typical CW QSO takes at my speed. Anyway, this mode is a blast, especially in my noisy environment. The weak signals still come through and get decoded in the noise. This was a very fun session playing radio! I will definitely be back to the JT modes for more contacts. On a side note - my little 2 watt signal was decoded in Switzerland as well! 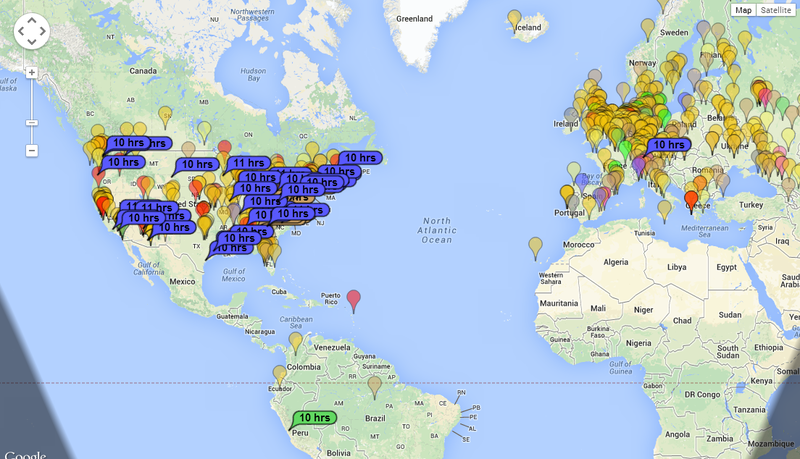 Not bad for 2 watts on 40 meters from an attic antenna. I did see a couple decodes of stations in South America, but I did not work them, or attempt to work them. If you haven't ventured into the digital modes, what are you waiting for? Jump in and have some fun! Good evening Burke, very nice contacts what antenna were you using? I fired up PSK31 for the first time last night and was only listening seeing how the receive was and it was very good. I still have to do some tweaking to get things going. Just get on the air! Still struggling to hear....or am I?